Back in September before we left on the cruise, my friend and I had the opportunity to spend a few hours in New York City. 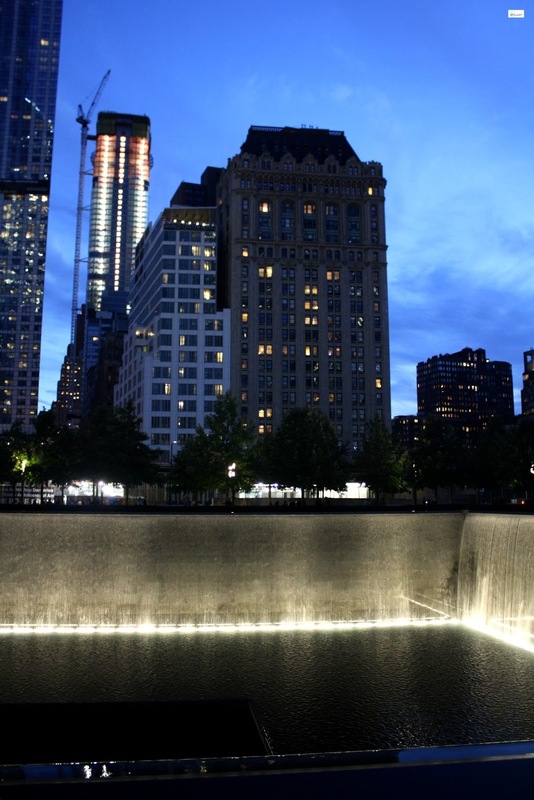 I was excited to return back to the city that I have a deep love affair with and one of the things that I wanted to do was have a chance to visit the 9/11 Memorial. 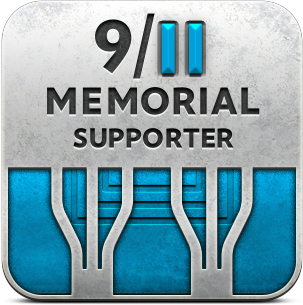 As a lady who has ties to the city I knew people who had been lost on 9/11 and as a (former) History teacher it has been extremely important to me to support the work of those who are helping to preserve the memory of that fateful day. 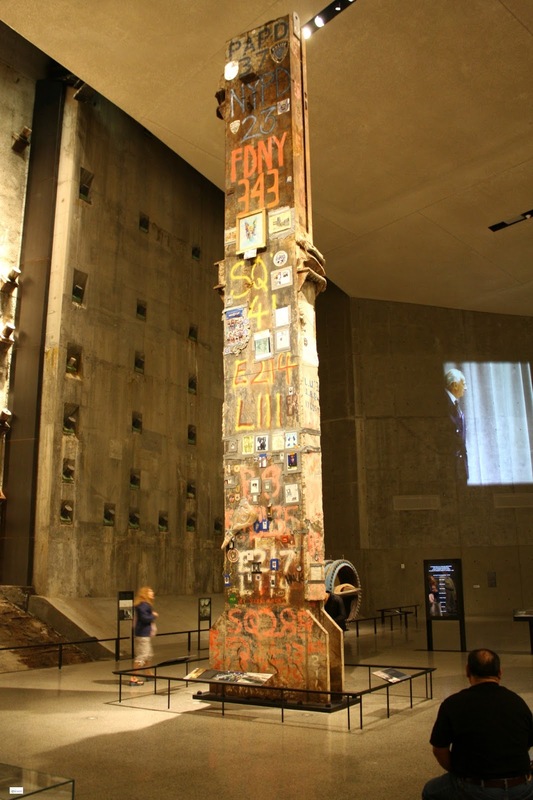 I became a 9/11 Memorial Supporter for many reasons, but most of all I saw this as a way to help support the mission of the museum to honor the memories of those killed on 9/11 and also to help educate future generations. I will be honest. It was an extremely emotional visit for me. It had been 14 years since I had been back to that area of New York City. When September 11th happened I was studying abroad in Europe and was on the first international flight back into the United States. In a haze of grief I made my way down to ground zero getting as close as we could on September 16th and cried with all of those who had lost so many loved ones. Returning back to this site- the site of so much loss- was an experience beyond words. I truly was amazed, humbled, and incredibly impressed with all of the details that went into the layout and design of the museum. 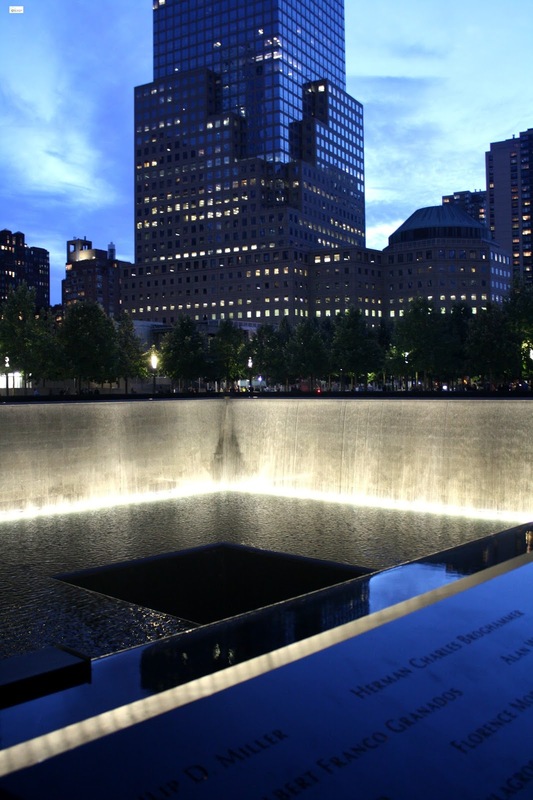 As you arrive at the museum you immediately see the Memorials twin reflecting pools as they are extremely large in size. An interesting fact is that the memorials pools are almost an acre in size and are the largest man made waterfalls to exist in the United States. Surrounding the reflecting pools is written every single person who died (including those at the Pentagon and in Shanksville, PA) not only on 9/11 but also in the 1993 attacks. The names are inscribed into bronze panels and as the museum's website states this is "a powerful reminder of the largest loss of life resulting from a foreign attack on American soil and the greatest single loss of rescue personnel in American History." Inside the museum there are several main exhibitions including the historical exhibition, the memorial exhibition, and foundation hall. The historical exhibition is what you walk through first and has three different parts to it. You see the time before 9/11, the day of 9/11 and then after 9/11. 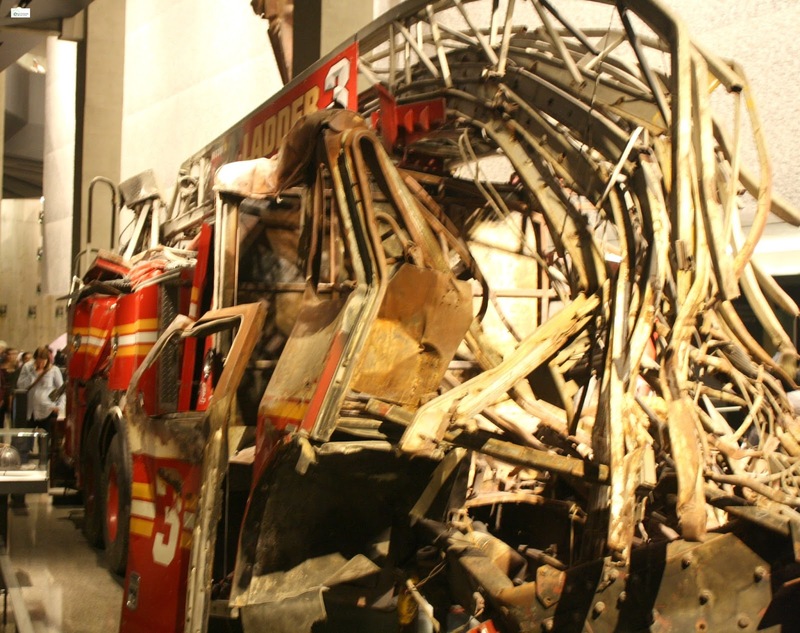 This part of the exhibition tells the story of what happened on the entire day, not just the events that took place in NYC, although the artifacts are just from NYC (as the other 9/11 memorials have their own artifacts pertaining to their sites if you visit them). 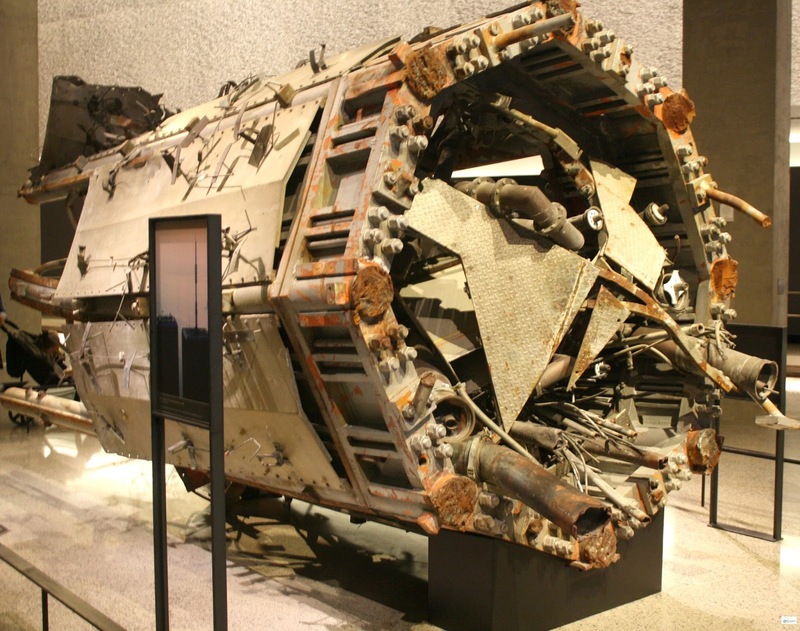 The artifacts that the museum has included are varied and give a very good layout of different parts of the WTC before the attack and then in the aftermath of the destruction. One example is the set of concrete stairs that are shown above. 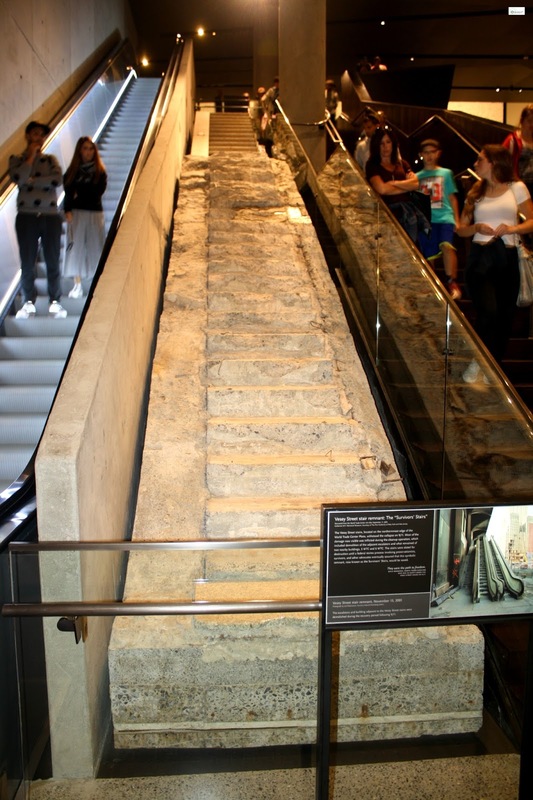 These stairs were used by many people to run down to safety before the collapse of the towers. There were items that left you speechless as you realized the implications of where they had been before (at the very top of the towers) and the conditions that they were in now. 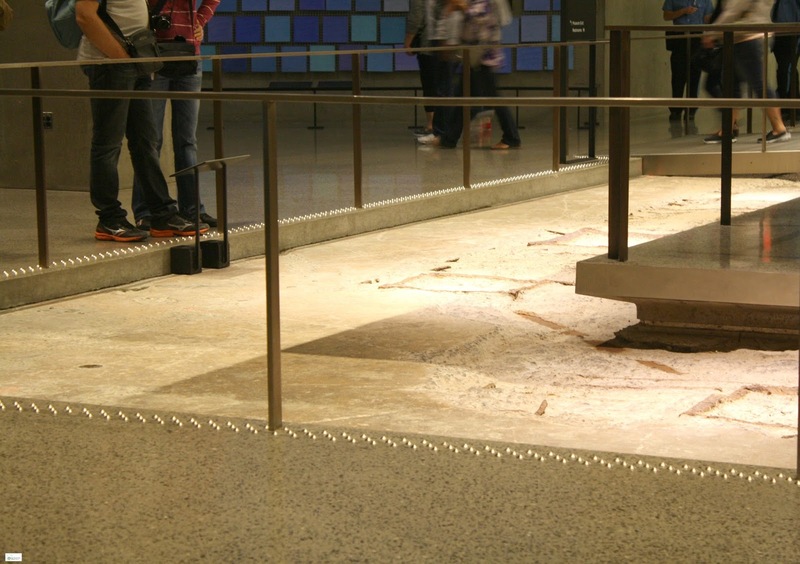 Around each item was pictures of before 9/11, the function that it performed, and typically it shared where the object had been located and found. Seeing the firetruck and remembering the bravery of all the firemen and rescue personnel who gave their lives to try to help was a sobering reminder of the extreme bravery they showed on that day. Photography in the memorial exhibition is prohibited out of respect to the families of those who lost loved ones. 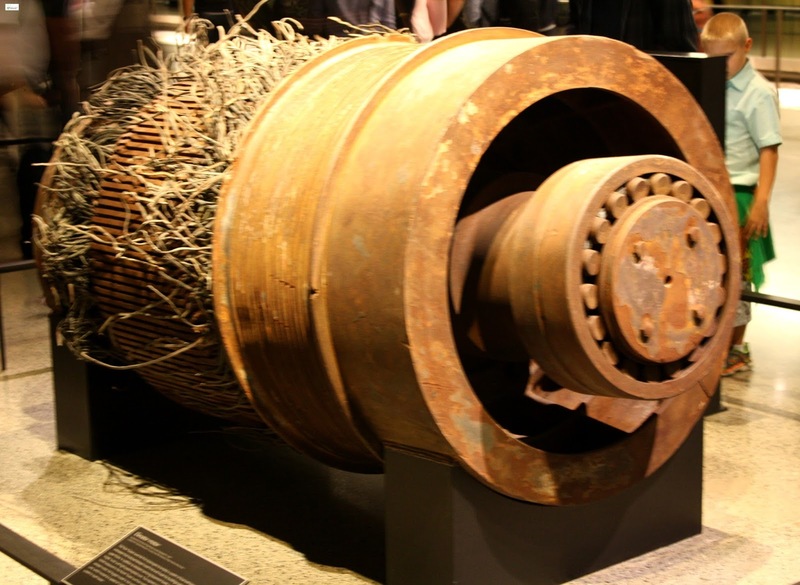 This picture is taken from the 9/11 Memorial website. After walking through the historical exhibition you come to the memorial exhibition. 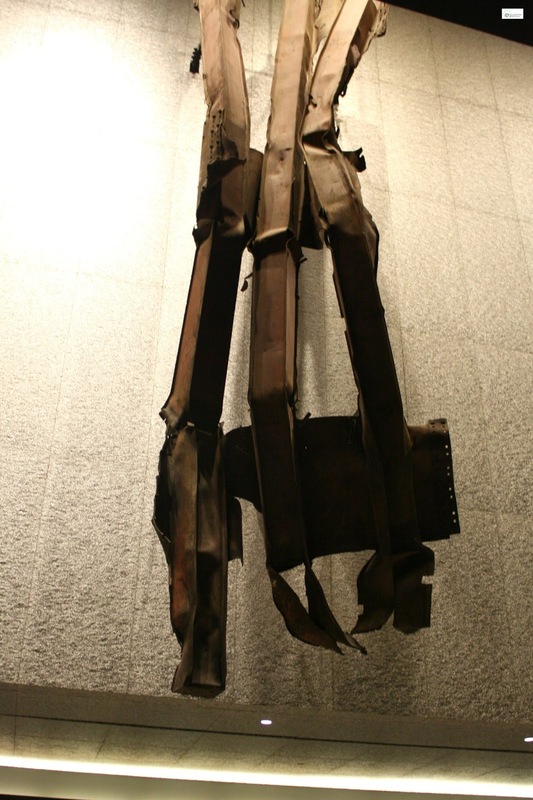 This exhibition is absolutely haunting as it commemorates the lives of those who perished in the two attacks on February 1993 and September 11th, 2001. As you enter the exhibition you walk along a corridor in which there are nearly 3,000 victims faces (that form what is known as the "wall of faces") and you immediately feel extremely small as you consider the scale of human loss. In this room are touchscreen screens that "allow visitors to discover additional information about each person, including photographs, images of objects, and audio remembrances by family, friends, and coworkers." Inside the exhibition there is an inner chamber that presents the individual victims on a large screen (in alphabetical order) with their loved ones talking about each individual. The final exhibition is known as foundation hall. The foundation hall is huge. Honestly the massive scale and height is unbeliebable and it hosts the "slurry wall". 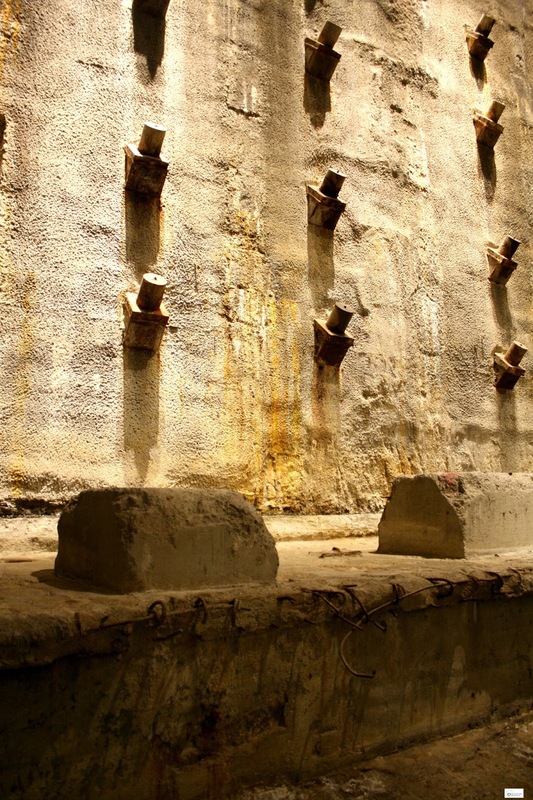 The "slurry wall" (seen in the picture above) is a surviving wall of the original World Trade Center. Also located in the foundation hall is the "last column". 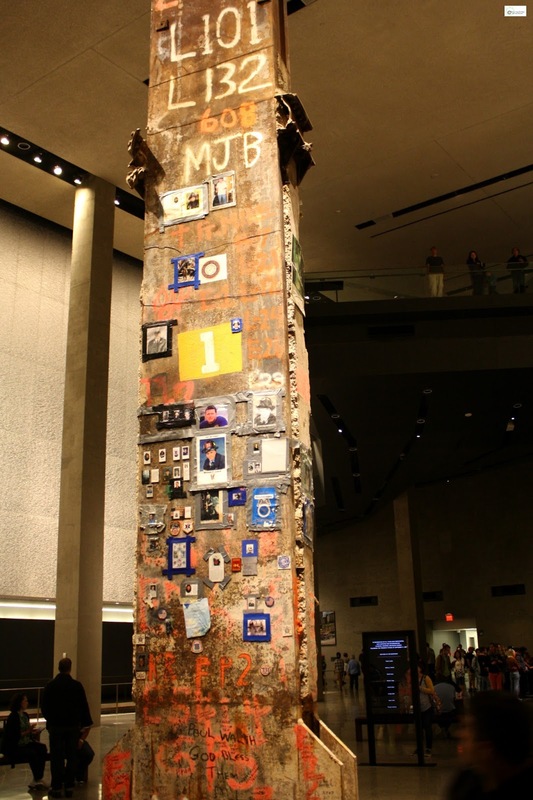 This column is 36 feet high and is covered with a variety of different inscriptions, mementos, missing posters, writings, and signatures placed there by the ironworkers, rescue personnel, and others who served to help at ground zero. 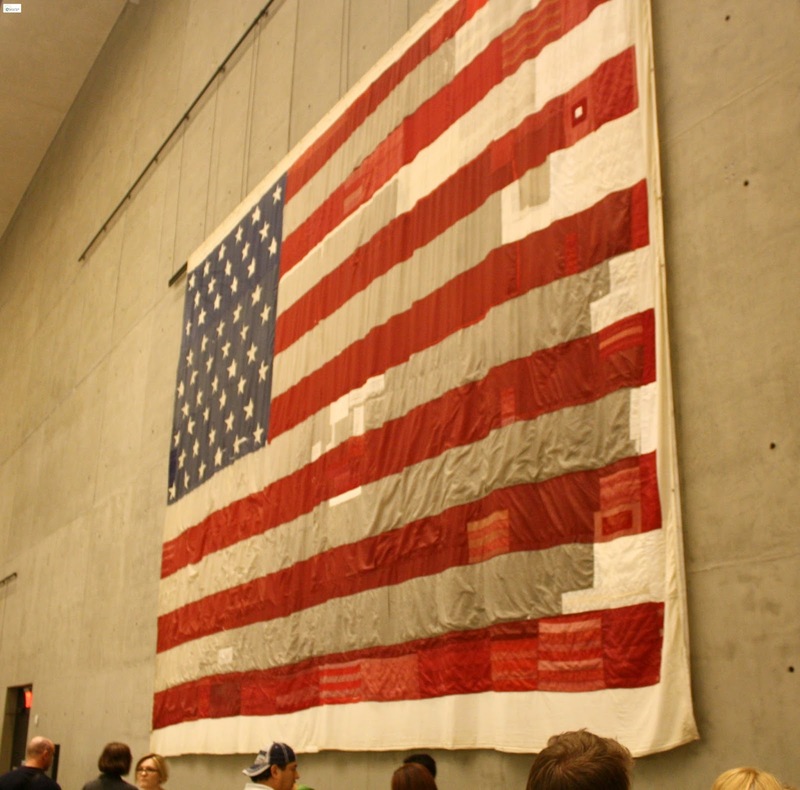 "Removed during a ceremony to mark the close of the recovery effort at Ground Zero, the coumn, the laid prone, was draped with an American flag and escorted by honor guard. Standing tall once again, the Last column will encourage reflection on the foundations of resilience, hope, and community..."
on the side of my blog. 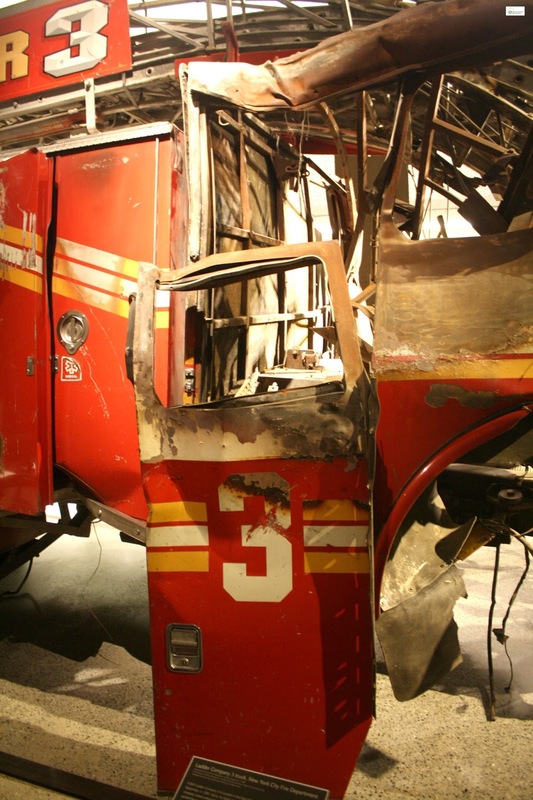 I hope that after reading about this amazing museum and the way that they are working to preserve the memory of those lost that day, the courageous acts of those who helped, and the memorial of such an important historical event that should never be forgotten you will consider becoming a 9/11 Memorial Supporter also. If you are interested in becoming a member you can find out more information by clicking HERE. If you live in New York City and would like to volunteer you can find out more information about opportunities to do so by clicking HERE. I have not been asked to promote this or am being compensated in anyway for this, I am just extremely passionate as an American citizen for the work that they are doing. 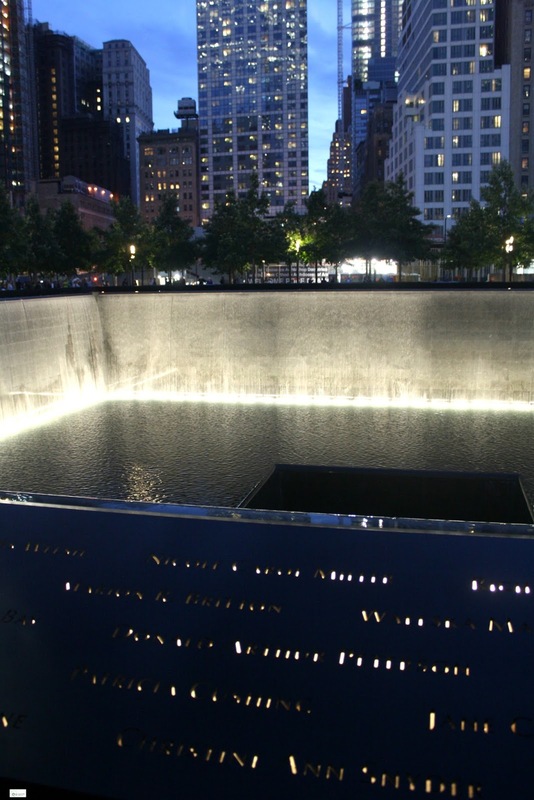 Have you visited the 9/11 memorial? What was your experience like? Never visited but this is a huge memorial. The memorial is definitely huge! The organizers did a wonderful job of including lots of historical and relevant information all while paying tribute to those who lost their lives in 1993 and in 2001. I hope you get to visit it someday! You won't regret it! The first time I went to NYC was about a year after 9/11. Ground Zero was still a smoldering work zone. It was an amazingly humbling experience. I TOTALLY agree with you- visiting Ground Zero was one of the my humbling experiences of my life! Have you had a chance to visit the memorial?